‘The mouth of the chattering burn.’ Hey, their words, not mine! When you see Aberlour’s A’Bunadh, it is quite obvious this is not your run-of-the-mill whisky: the deep tawny-red color is highlighted by a clear glass bottle, short with a high shoulder. The spirit is clear, and when backlighted has tones of polished oak, but when in shadow, the whisky looks like an alchemist’s reagent for making dragon blood. Or maybe it is dragon’s blood—it’s strong enough! Bottled typically around 60% (my bottling, #46, is at 60.4%), A’bunadh has enough kick to get anyone’s attention. This is a spirit to be approached with respect. Whisky like these guys used to drink? But that’s just the thing—Aberlour’s single-cask, sherry matured limited edition, ‘of the origin’ (in Gaelic, A’bunadh) looks as inviting as a sangria on a hot day. It begs to be drunk. But one should think twice about taking this one neat. Perhaps the Aberlour name is sufficient warning for you. 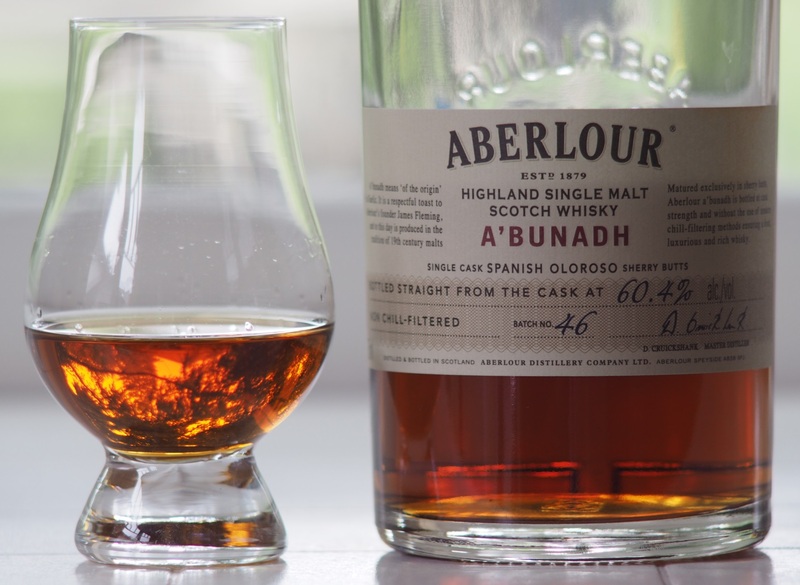 Aberlour is from Obar Lobhair, in Gaelic, ‘the mouth of the chattering burn.’ I’m not kidding, read it on their website. How evocative is that name? You can just imagine some primitive Scotsman, back in the day of damp wool and howling storms, coming in from tending his flock and reaching for the whisky. ‘Mouth of the chattering burn’ indeed. Almost makes me want to go out and get damp, run through the rain with the sheep for a few hours, just to enjoy the warmth of hearth, home and dram at the end of a day. But, unlikely for this city dweller. So, what’s in the bottle, after all? 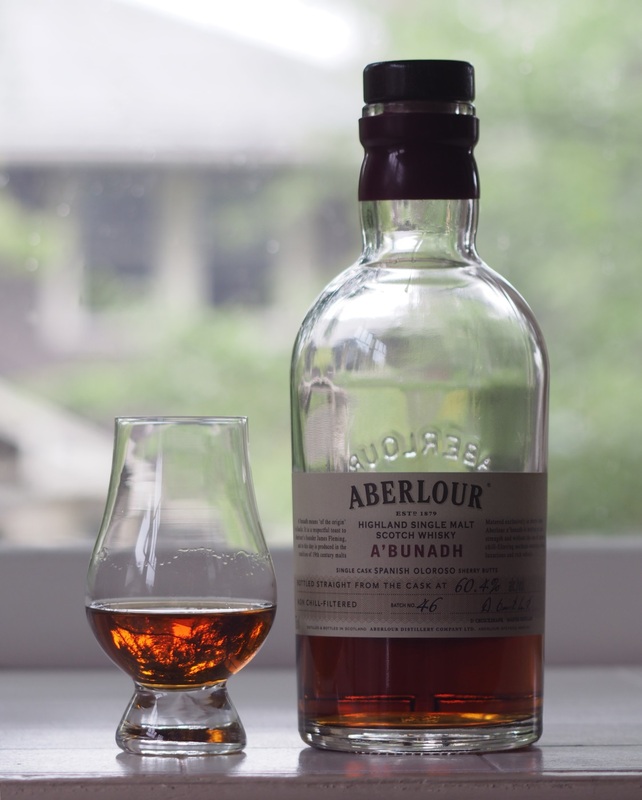 Aberlour describes this expression as ‘batch limited, cask strength,’ and says it is ‘made in homage to Aberlour’s founder, James Fleming, using only traditional methods without chill filtration or other modern processes.’ Okay, non-chill-filtered, but what of other modern processes? No color I would assume. And what of the batch being limited? Limited is a relative term, as it is not so hard to find the A’bunadh. There is no age statement, so for some amount of time (5 to 10 years is a good guess) the spirit is matured in sherry butts, which gives it flavor and color—a lot of both. The color you can see from the photos. As for the flavor, well, this has a nose. When nosing the A’bunadh, you don’t need to stuff your proboscis in the glass, just waft the glass a couple inches under your nose. That’ll do. Note: each batch will be a bit different. Old hands will invariably say the older bottlings were better, they always say that about everything. Try for yourself, this is pretty special stuff. Just look at that color. Nice bokeh, too, eh? Old Japanese lens, modern camera. Nose: Careful sniffing reveals a light maritime air; add a bit of water to find orange, apple, sherry and honey (instead of burning your nose). Palate: Pleasantly full and oily mouthfeel and surprisingly smooth even at full strength; taste is sweet, with plums and sherry with a little orange to spice it up. I tasted full strength: juice up from the aroma then take a very small sip and be rewarded with heat unmatched. Add a little water to bring out more honey. Finish: Lingering, aromatic, sherry w/ touch of oak, cocoa and pepper (when taken full strength). Bottom line: Blows Macallan out of the water. Makes Bunnahabhain look like weak sauce—and that’s a good whisky. This is a real ‘sherry bomb’ with lots of fruit flavor, and quite sweet, which makes it a special-occasion dram. I have tried the Aberlour 12 and found it wanting. This stuff, even with a little water, will make a partially-sherried whisky taste like a Speysider. It is pricey, about the same as Tobermory around here (mid $60s). But think of it this way: you can pour 3/4 whisky, 1/4 water and still be up on flavor versus a lot of whiskies. Bottom line, everyone should try it at least once. Preferably after working hard out in the cold mist for a few hours. This entry was posted in Scotch-single malt, Whisky and tagged A'Bunadh, Aberlour, bunnahabhain, Macallan, Scotch, sheep, single malt, Whisky. Bookmark the permalink. Lovely review! For me, however, the magic of this whisky comes, not from the dragon blood (although great analogy!) but from the strength itself. The a’bunadh is meant to be wild and untamed by water. This whisky is Drogon, not Rhaegal or Viserion!